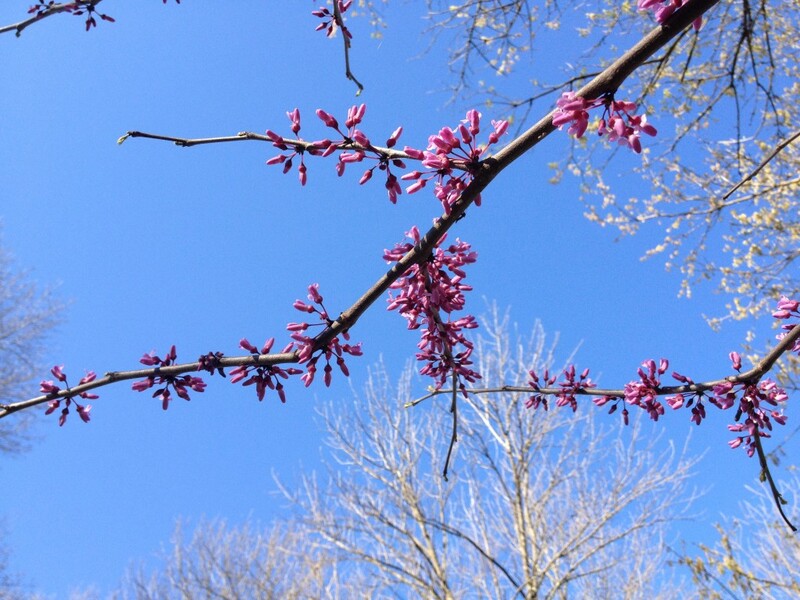 As we’ve been walking the Raleigh Greenways as part of our 100 Miles in 100 Days series, we have seen pops of bright magenta in the trees all along the way. This bright pink color is thanks to the Redbud tree, and not only is it lovely, it’s also one of my favorite wild edibles. Unlike many of the wild edibles we’ve posted about so far, this one is not an interloper from Europe or Asia; rather it’s a tree that is native to North America. This is exciting in part because it seems a rare quality among many of the wild plants we’ve been foraging, but also because it is perhaps a small peek at what the local landscape may have looked like before European colonization of people and of land. It leads us to explore another part of our local history. 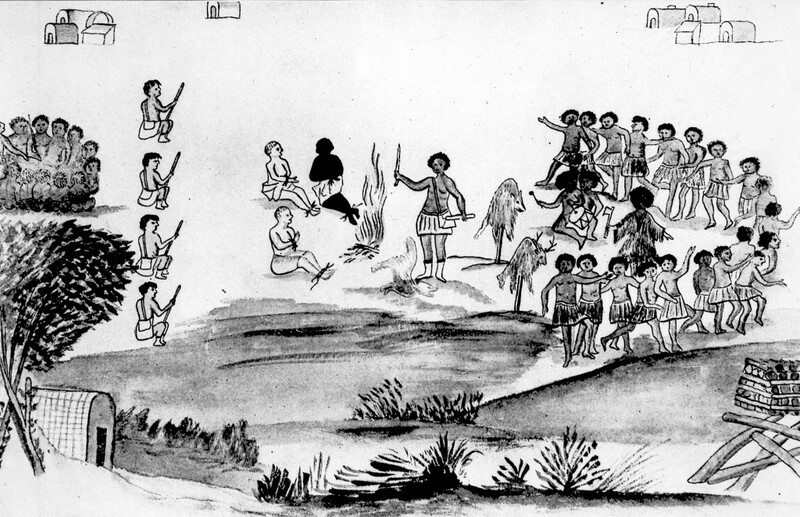 The Tuscarora tribe of Native Americans who made their homes in the Piedmont and coastal regions of North Carolina are probably familiar, at least by name, to those who grew up in the state. They were the people who first encountered the English settlers exploring their land, and they are the people whom the Tuscarora War references after fighting (unsurprisingly) began shortly after contact. While John Lawson was wandering around Raleigh–pre-Fayetteville Street–he encountered what we know as the Neuse River. That same year, the Neuse River’s ostensible namesakes, the Neusiok tribe of Native Americans, were experiencing their last known year of existence. 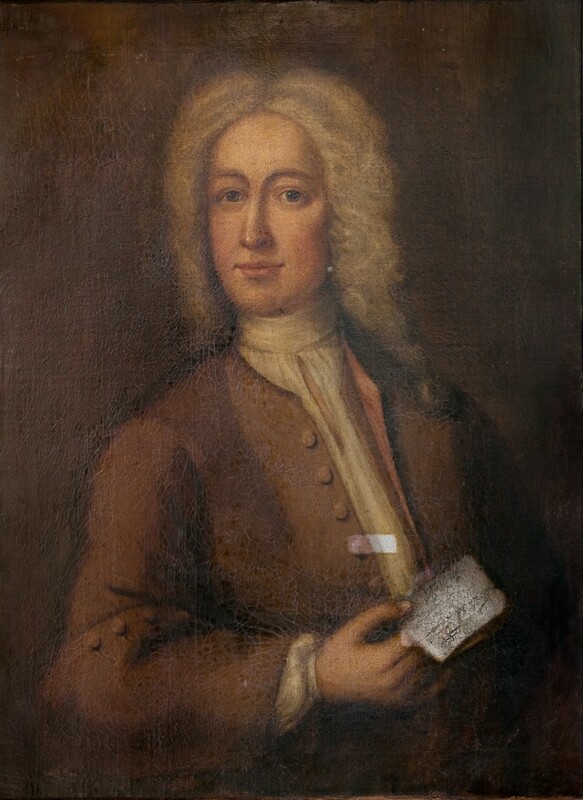 There were only four remaining members in 1700, and they are believed to have been absorbed by the more populous Tuscarora. 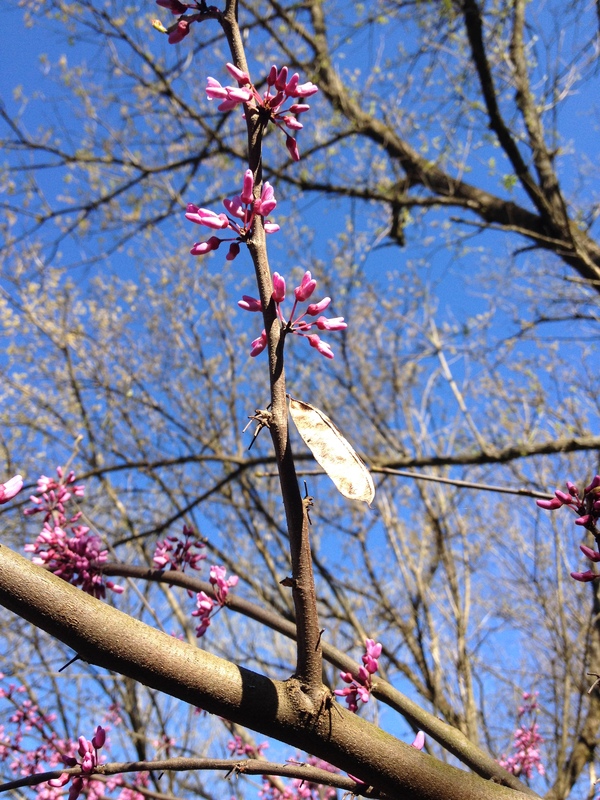 Tying this all back to our 100 Miles in 100 Days series, these redbud trees were used by the Neusiok, Tuscarora, and other people who had been living on land that overlapped its habitat. They ate them cooked or raw, and used infusions of them to treat issues like fevers and coughs. So what are ways we can use this versatile plant today? The flowers are beginning to dwindle, so get them quickly! But even if you miss them, they produce another product next – little snow-pea-like seed pods. This is why it’s important to note where you saw the blooming trees, so you remember where to return for the next harvest! Old pod from last season. Description and Habitat. 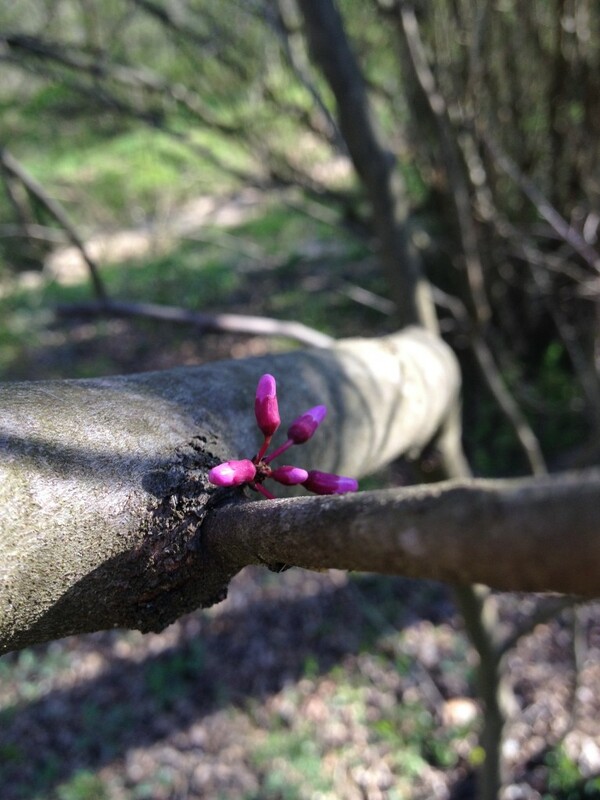 Redbuds are deciduous small trees or shrubs in the pea family. They grow in the wild and are also grown ornamentally, so you could see them in forests, along greenways, or even in your neighbor’s lawn. They generally bloom better with at least some sun. Look for clusters of bright pink/purple flowers growing in bunches right along the stem or trunk in spring, for snow-pea-like pods hanging from the branches after they flower, and for heart-shaped leaves. Harvest. 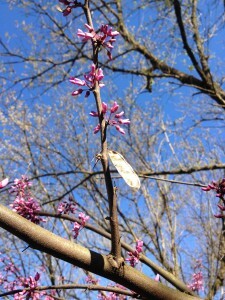 Redbud blossoms can be harvested in their unopened bud stage or in bloom. You’ll notice them blooming from late March to mid April. 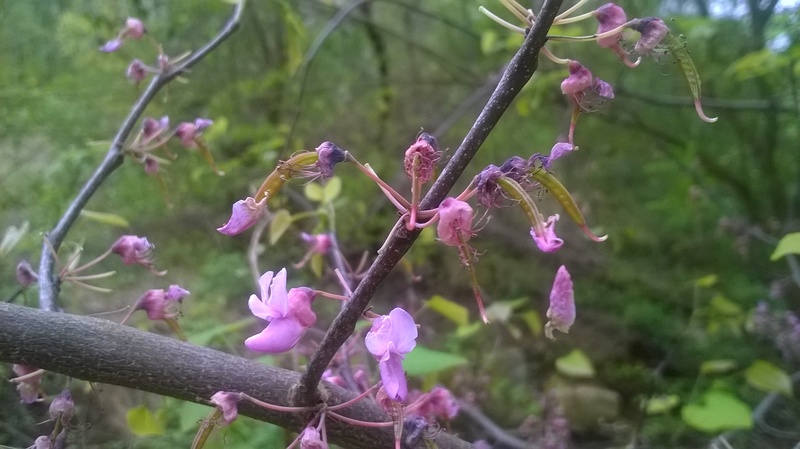 When the flowers die back, the trees set small snow-pea-like pods that are also edible. Get them when they are almost as long as your thumb but while they are still tender before they turn tough or dry out. Small new pods beginning to set as flowers fade. Flavor and Use. Flowers and pods both have a very pea-like flavor and lend a delicious fresh crunch to salads, wraps, and sandwiches. Unopened blooms can be pickled like capers, and blossoms can be made into jellies. Eat seed pods as you would snow peas. Young leaves are also edible raw or cooked. Think of these as your new favorite portable way to eat salad. Adding edible wild flowers to these makes for a stunning presentation as the colors show through the transparent wrappers. 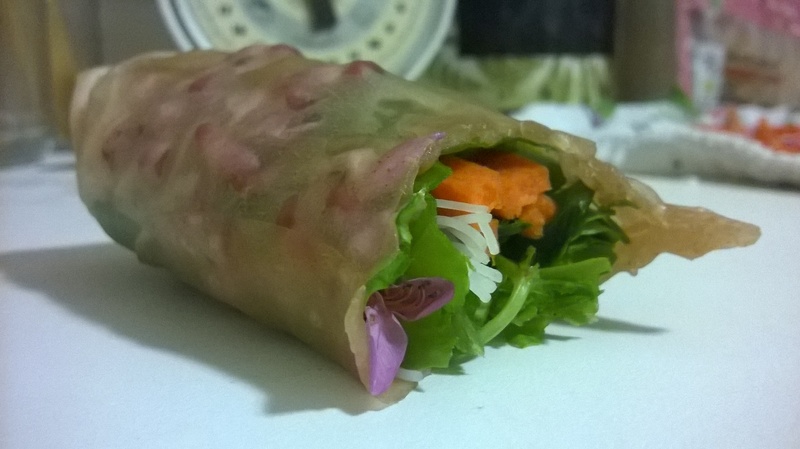 Now you will need your spring roll rice paper wrappers. Dip them in warm water (about like bath water) until just starting to soften and bend (they will continue to soften as you work). Lay out flat on a smooth work surface (note wood surfaces tend to stick). Layer a mixture of fillings of your choosing from above in the center of the top third of the wrapper. Stretch and fold top of wrapper down to just cover ingredients. Then fold in each end like a burrito. Finally, roll contents to bottom of wrapper, keeping ends tucked in. 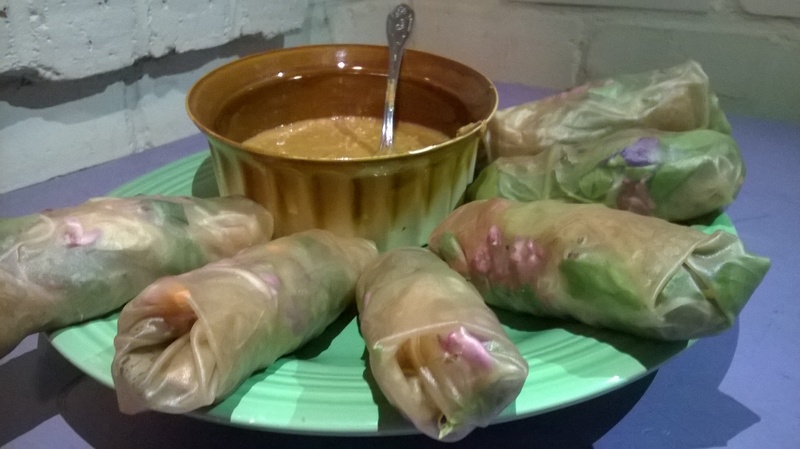 Serve with dipping sauce of your choosing – such as a spicy ginger-garlic peanut sauce [make by blending ginger, garlic, peanuts/peanut butter, soy sauce, and oil together to your desired taste]. Piedmont Picnic at bEARTHday with Raleigh City Farm!